Western blot analysis of extracts from HEK293 cells alone (-), expressing β-arrestin 1 (wt) or β-arrestin (Ser412Ala) mutant (Ala412), using Phospho-β-Arrestin 1 (Ser412) (6-24) Mouse mAb. Lanes 1 and 3 show endogenous levels of phosphorylated β-arrestin 1. Immunoprecipitation of β-arrestin 1 from HEK293 cells using a polyclonal antibody to phospho-β-arrestin 1 (Ser412), followed by alkaline phosphaphatase (CIP) treatment. 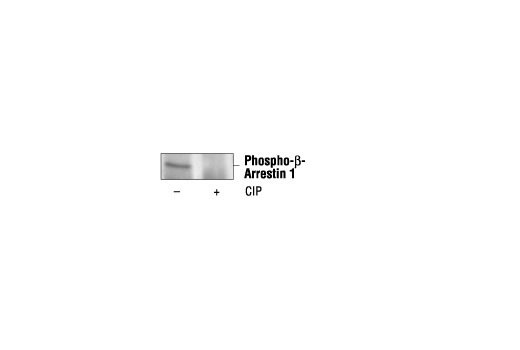 β-arrestin 1 was detected by Phospho-beta-Arrestin 1 (Ser412) (6-24) Mouse mAb. CIP treatment abolished the β-arrestin 1 signal, indicating that the monoclonal antibody is phospho-specific. Phospho-β-Arrestin 1 (Ser412) (6-24) Mouse mAb detects endogenous levels of β-arrestin 1 only when phosphorylated at serine 412. 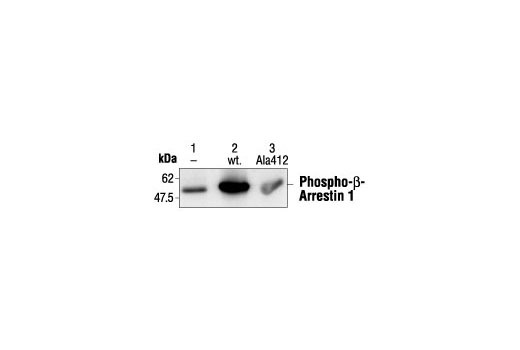 The antibody does not cross-react with beta-arrestin 2. Monoclonal antibody is produced by immunizing animals with a synthetic peptide corresponding to residues surrounding Ser412 of human β-arrestin 1. Erk1/2 constitutively phosphorylates β-arrestin 1 at carboxy-terminal Ser412, which promotes cytosolic localization of the scaffold protein (11). Agonist stimulation of β2-adrenergic receptors results in recruitment of β-arrestin 1 to the plasma membrane and rapid dephosphorylation of arrestin. Dephosphorylation is an essential step of β-arrestin 1-mediated receptor endocytosis, but it is not required for receptor desensitization (12). Lin, F.T. et al. (1999) J Biol Chem 274, 15971-4. Lin, F.T. et al. (1997) J Biol Chem 272, 31051-7.